University of Oxford research, supported by Oxford University Hospitals, is looking to halt and even reverse vision loss for blind patients at the John Radcliffe Hospital. Electronic retinal implants - referred to some as the 'bionic eye' - are designed to replace the lost photoreceptors in the eyes of patients suffering from degenerative retinal diseases. In healthy eyes, light falling on the photoreceptors in the retina is converted into electrical signals which are carried by the optic nerve from the eye to the brain where 'seeing' actually occurs. In many retinal diseases, such as retinitis pigmentosa (RP), the photoreceptors die, and therefore the light falling onto the retina can no longer be converted into electrical signals. The research involves surgery to place an electronic retinal implant underneath the central part of retina which is connected by an electrical cable to a power supply behind the ear, which can be recharged wirelessly via electromagnetic induction. 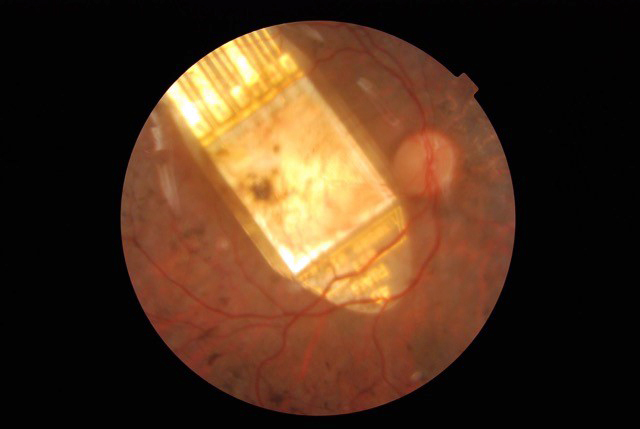 The electronic retinal implant, pictured below, is a grid of photosensitive electrodes similar to those found in digital cameras and is able to act as an artificial layer of photoreceptor cells. It is able to convert light into a pixelated array of electrical signals which can then be carried to the brain by the optic nerve. Patients have reported detecting light after the electronic retinas were switched on and later the return of some of their vision in the trials, led by Consultant Vitreoretinal Surgeon and Professor of Ophthalmology Prof Robert MacLaren. Prof MacLaren is also trialling a new form of gene therapy to tackle rare genetic degenerative eye condition choroideremia. Sufferers are missing a key gene in their retina, and the technique involves injecting a virus into the eye to deliver billions of healthy genes to replace the missing gene. Without the protein produced by the missing gene, pigment cells in the retina of the eye slowly stop working, then die off. The gene therapy carries the missing gene into the light-sensing cells in the retina to start producing protein and stop the cells dying.